It’s almost time to kick off our annual summer camp! This year we are making a medallion quilt designed by seven of our super talented chefs. This quilt is special not just because of the talented team of makers behind it but also because it’s designed for customization. We call it the Choose Your Own Adventure Quilt. Each round of the medallion will have two options so you can make a quilt that’s exactly what you love. Our official kick-off date is June 17. We will tell you at that time what to pack for camp (fabric requirements 😉 ) and announce more details about the design. We will also have a printable calendar available so you can keep track of post dates as well as the blocks you plan to make for your quilt. The first block instructions will be posted June 25. The design works with layer cakes and fat quarters if you want to start shopping your favorite quilt shop or your stash. As always we will be posting block instructions here on the blog with some extra fun content on our social media accounts as well. Be sure to follow us and join our Moda Bake Shop Bakers group to join in (social links below). 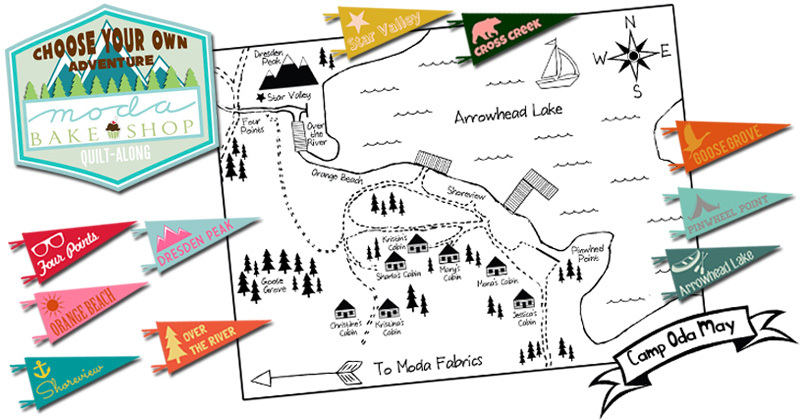 This entry was posted in Events and tagged Choose Your Own Adventure QAL, Oda May's Summer Camp, Quilt-Along. Oh I do love an adventure! I hope the quilt blocks and the quilt have been made from start to finish. There were too many errors in the last quilt. The last quilt was all blocks that had been made on the Moda Bake Shop! I made it and didn’t have any issues other than 1 post that had a typo on finished block size. First Block on my birthday!! YAY! This is exciting! Looking forward to joining the fun. Will you be sending a list of the fabric requirements soon? Hi, have you posted the requirements somewhere? Can’t wait to see the pattern! I am currently working on a monthly medallion mystery quilt done by a LQS. The fun part is not knowing what the next round will be until the following month. Looking forward to June 25. It’s wonderful that so many younger men and women are quilting now, but please don’t forget about us “not so young” women. It may seem fashionable to blog with light grey ink, but it is very difficult for me to see and read the writing. Could you please make the blog printing in black so I can read it. I’d really appreciate that. I agree completely. It is hard to understand why any organization would put design above functionality. Can’t you have both? Light grey with a light font = hard to read web site. I am sure the older generation still buys a lot of you products. Can the background fabric be a print? Can the Background fabric be directional? Lorie, I think if you make the background fabric a print, then it would be wise to use solids for your block pieces. Since it is a medallion quilt, the blocks go in a frame around the center so even if you are very careful with something directional it may be tricky to not end up with sideways or upside down prints. Excited for June 25 and the center medallion. Am an appliquer and excited about that. I’m having trouble locating the June 18 blog with the basic design and requirement information. Can you provide me a direct link please? This is so fun and exciting. How do I find the blocks? Question: will I miss something by not being involved/active (or whatever you call it) on Instagram? where can I locate the calendar for the sew along? I really appreciate how many people work so hard to bring us exciting new projects!